Hand diced results are achieved by using the unique four-dimensional precompression which quite simply holds the fresh meat firm while it is being cut through extremely long grid blades. Four dimensional pre-compression guarantees for the perfect cutting edges all-around. Refined shape of the slice-cut knife ensures a powerful, smooth and clean cut. 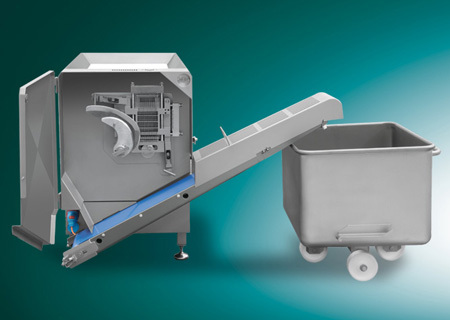 Ergonomic single-handed operation with lengthwise chamber opening; extra durable cutting grids to cope with hardest workload as standard feature, including a time saving double chamber system assures loading and dicing together. 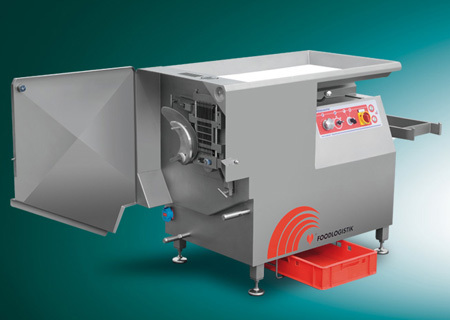 Piston advance at choice continuous for high volume cutting with double or four-bladed knife or intermittent cutting with single cut knife achieving precise cubes. Minimum set up time to change grid sets, no tools required! !